Though, staying cool on a warm Summer’s day is just one thing that the best ceiling fans are able to provide your home. The best ceiling fan can also redistribute warm air on a cold day so that a room has a very even temperature. How can you make sure that you’re finding the best of the best fans that are on the market today? Through these exclusive ceiling fan reviews that take a fact-based approach. You get the information you need to make a good decision. Here’s the Best Chart for Ceiling Fans Today! For you to find the best ceiling fan possible, you need to be able to quickly compare and contrast makes and models. The chart below will help you quickly see which ceiling fans will work for your home and which ones will not. Why Do You Need the Best Ceiling Fans? Not every home comes equipped with central air conditioning. Some homes don’t have any way to move air around a room, much less an entire home! You could spend a couple hundred dollars on a window-based air conditioner, but you’ll increase your power bills by doing so and be using a product that may not be environmentally friendly. When you’re using a ceiling fan, however, you’re using something that will displace or vent the hot air from your home so you’re left with cooling comfort. The classic ceiling fan that has a light fixture, which may be optional, should have a few standard features to help it be considered one of the best ceiling fans. There should be a reversible motor included so that the fan can spin both ways. There should be at least 3 speed settings included so you can move air as quickly or slowly as needed on any given day. There should be an angle to the blades, at least a slight one, so that the air movement is more efficient. It should be Energy Star rated so that you don’t experience massive increases of your utility bills. A good ceiling fan can be used to cool down a room in a few minutes and provide an extra level of comfort. The best ceiling fans can be used all year long to keep any room or an entire home at an optimum temperature. Whether you install a classic 5 blade design, an attic fan, or you simply need a fan that can vent the stale air and moisture out of a bathroom, the ceiling fans reviews that can be found right here will help you find the perfect fan today. What Are Some Common Problems With Ceiling Fans? It’s the mount that can cause homeowners some problems when installing a ceiling fan. Many homeowners tend to use the standard mount, but that’s not always the best solution. Angled mounts work better for sloped ceilings and flush mounts work better when you have a hugger-ceiling fan design. Low ceilings can also become a problem. Many ceiling fans come with a 12-18 down rod that is used for the standard installation, but that means the ceiling fan drops to a 6-foot height on an 8 foot ceiling. That’s bad news for those that are a little tall! Look for ceiling fans that have a 4-inch down rod to counter this issue. Ceiling fans that are made from natural materials will expand and contract over time and this may cause splitting or cracking. Look for wood blades that are designed for high wear if you don’t want to install a ceiling fan with plastic blades to avoid this issue. How Can I Find the Best Ceiling Fan? 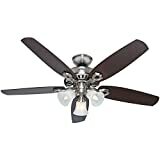 The first thing you’ll want to look at for any ceiling fan is the cubic feet per minute of air that the unit can move. Some ceiling fans might be 50 inches in diameter, but they spin so slowly that they’ll only be rated for an installation in an 80 square foot room. On the other end of the spectrum, some ceiling fans can move thousands of CFM and are capable of being installed in rooms that are as large as 500 square feet! To find those ratings, one of the best places to look is at our comprehensive reviews. Each review is specifically designed to help you find the best ceiling fan for the room type and size that you have. Some ceiling fans are outdoor rated and perfect for that sun room addition. Others are petite and hug the ceiling, making them a good value by for a small bedroom. A final consideration is to look at the balancing technology, or lack thereof, that is included with the ceiling fan’s design. When a ceiling fan is operating at its highest setting, physics demand that the fan will wobble somewhat because of the massive amount of momentum being generated. Balancing technology keeps the fan stable so there won’t be ceiling impacts or loud helicopter sounds coming from the fan. What Are the Prices on the Best Ceiling Fans Today? Good entry level ceiling fans can be found for about $50 on Amazon today. These ceiling fans are good for standard bedrooms, about 12×12 feet in size, and should have variable speeds. A 20% premium may help you to get reversible motors so that the ceiling fan can be used all year instead of just in the warmer months. On the other end of the pricing, a premium ceiling fan can be as much as $300. These ceiling fans typically have some artistic components, such as being made from distress koa wood from Hawaii, and have high powered motors that provide a superior level of air flow. These top-of-the-line ceiling fans generally have lifetime warranties on their motors and displace a lot of air. Although this ceiling fan has a 52-inch diameter, there is a lot of air movement power that can be found with it. The Hunter Builder can cool down a room that is up to 400 square feet in size, so it’s perfect for the large living room, the game room, or other areas of the home that are typically cooled with air conditioning. Once installed, you could potentially save up to 40% on your summer heating bills with this fan working for you! It’s the user-friendly features that make the Hunter Builder Plus stand out from the rest of the ceiling fan pack. There are three fan speeds, your basic high, medium, and low, that will help you manage the airflow in a room that is up to 485 square feet in size. It is also possible to reverse the way the fan spins so that warm air can be better circulated in the cooler months to lower heating and cooling bills all year long. All of this adds up to providing your home with one of the best ceiling fans that is available right now! Although small room ceiling fans are generally short and compact, you won’t find that with the Westinghouse Contempra IV. It has a 52-inch wingspan that provides good air movement right along the ceiling and the walls. This lets you cool every inch of the room and ultimately lower your utility bills because it costs less to cool a room with this fan than an air conditioner. You’ll get all of the installation items you need as well, including a 12-inch lead wire. The unique design of the Minka-Aire F518 makes it the perfect ceiling fan for those rooms or homes that have an 8 foot ceiling. It has a 10.5-inch hanging depth, so you won’t have to worry about smacking your head against the fan after it has been installed. The blades have a 14-degree pitch to them, allowing the design of this fan to move a lot of air. Because it’s so compact, there is very little wobble to fan as well, minimizing any chances of damage occurring too. When it is at high speed without the light on, this ceiling fan will only use 40 watts of power! This ceiling fan really does epitomize what the modern ceiling fan is supposed to be. It looks like you’d need to spend a small fortune to get it, but it’s priced fairly and does just as good a job as its commercial quality counterparts. You can recirculate warm air or cool down any room with ease and it features 52 inches of coverage on one of the easiest installations that you’ll ever have. It has a 78-inch lead wire and a 0.75×4 inch down rod so that you’ve got plenty of room to work. The light looks like it is a halogen design, but it is really two torpedo bulbs that are up to 40 watts and have the candelabra design. When all is said it done, the total energy usage of this ceiling fan is just 101 watts with the lights turned on. Unlike other ceiling fans that offer 3 speeds for a customized air movement experience, the Westinghouse Industrial offers 5 speeds for a better overall environment. Even though it provides extra power, it won’t use extra power to generate more air movement, needing just 60 watts in total to run without lights. With a .5×12 inch down rod and a ball hanger installation system, it won’t take much time to get this beautiful ceiling fan up and running. These are metal blades, however, so make sure you install this ceiling fan where there is plenty of space! This is the ceiling fan for someone who already has a fan in place that they’re looking to upgrade. If you don’t have an existing ceiling fan, then you’re going to need to purchase a down rod separately because the Minka-Aire doesn’t come with one. It also doesn’t have a light kit included with the fan, so you may need to install it somewhere besides an existing light fixture. This means it may not be suitable for every DIY installer, but it will look great once you get the ceiling fan up! It’s the hugger style of installation that really gives this petite ceiling fan it’s versatile usefulness. Available in white or a classic antique brass finish, it can be used in all seasons thanks to the reversible switch that is included in the design. The single light fixture offers an opal mushroom glass covering for a little extra style and you’ll get everything you need for a high quality installation that can be completed in an hour or less in most circumstances. There are a lot of small rooms that could use a ceiling fan, but the fan itself ends up being too large for the room. With the Westinghouse Petite, that’s rarely a problem! The Westinghouse Solana is a 48-inch diameter fan that offers you an opal light fixture that is made from frosted glass. This gives it a bit of a traditional feel while still adding a touch of visual appeal once the installation has been completed. 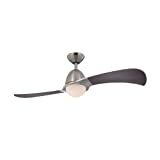 The blades are made from plywood, but have a brushed nickel finish, so there is added durability to the construction of the fan. The bulbs are candelabra sized 60-watt ½ bulbs, so replacement lights might be a little difficult to find, but otherwise the Solana is a ceiling fan that is simple to install and use. The installation of this fan is what immediately makes it stand out and certainly contributes to it being a #1 best seller. It’s got a 3-position mounting that lets you have a flush, angled, or standard mount for the fan. Just turn the power off to the circuit, wire it up, and then you’re ready to experience the cooling benefits that this ceiling fan has to offer! The quality of this ceiling fan is on par for what you’ll find in the industry today. The blades will break if you put enough pressure on them or if an object hits the blades while the fan is spinning at high speed. It’s the performance and the visual appeal that makes the Hunter Builder Deluxe truly stand out. The best ceiling fans are waiting for you to see them right now. Use our comprehensive reviews to your advantage, get the information you need, and you’ll be able to make the best decision. You don’t have to base your decision off your first impressions or your gut feelings any more. With the best ceiling fan reviews, you can make an informed decision every single time!